As it’s been the month of hummus for this year’s Vegan MoFo, anyone who comes into my kitchen gets to make a hummus with me! My lovely friend Nicole was over for a date where we were going to organize my closet (I know, she’s an awesome friend). We decided to make lunch, and of course, as we are both pickle lovers, all of our adventures must include pickles. You may remember our previous Pickled Soprano cocktail adventures — but this time we were making real food: Dill Pickle Soup to be precise. And the thought came up while we were making the pickle soup — could we also make a pickle hummus? Of course, it had to be done! And ohhhhh man, am I glad we did. This is my absolute favourite hummus that we have made so far this month (but stay tuned, I think this weekend’s hummus plans are going to yield some delicious results). We wanted it to be full of pickle flavour, so we used fresh dill, lots of garlic, and garlicky dill pickles. The resulting flavour is full of delicious dill and takes us back to memories of eating dill pickle potato chips — but this time with all whole-food good-for-you ingredients! We’ve already had taste testers ask for the recipe, and they couldn’t wait for it to go up on the blog this week! 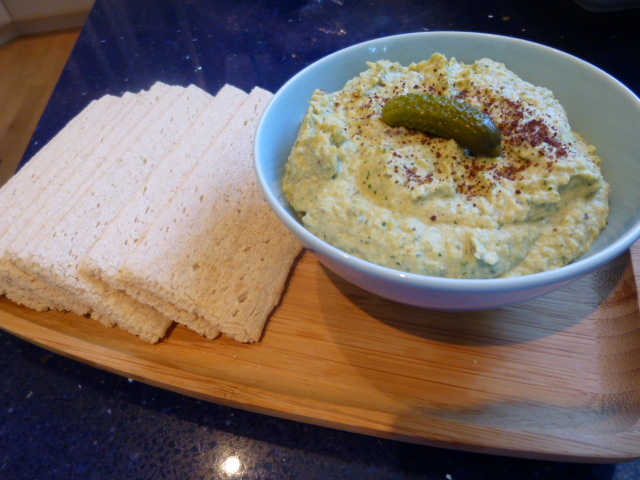 We decided to use the Polish dill pickles (Polskie Ogórki –– tangy and sour garlic and dill pickles) for our pickle soup, so we also used them for the hummus. I also tend to buy the pickles that are “EXTREME GARLIC” flavours, and they’d be great here too. 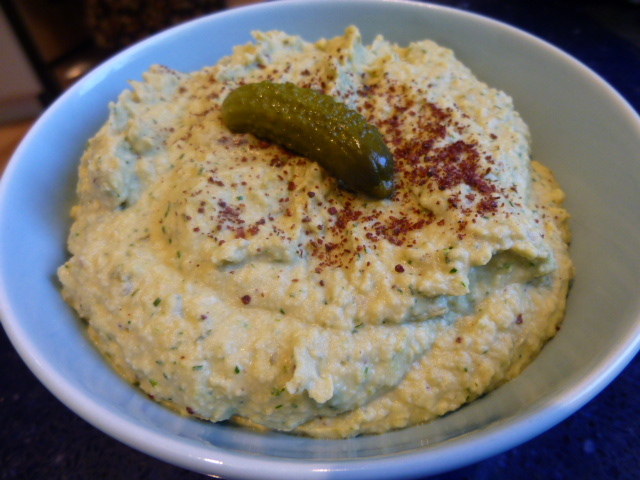 We topped the hummus with a little gherkin for decoration (and sprinkled it with sumac), but you could also use some chopped fresh dill as the topping here and it would look wonderful. Eat with dill pickley delight! 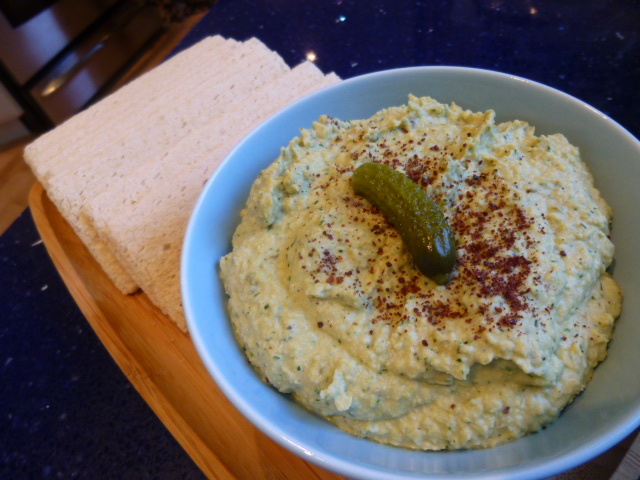 How genius to add dill pickles to hummus!!! Oh my word. My mouth seriously is watering. I love this idea!! I also wish I hadn’t just dumped those too soft pickles I canned last summer. You had me at pickle! What a creative hummus, I love it! This sounds delicious! My Mouth is Watering! It’s still my favourite hummus of all of Vegan MoFo! Oh, man! I’ve got to try this! I’m such a big pickle fan and huge hummus fan. This would tick all of the boxes! I somehow missed this post during VeganMoFo. Oh my effing GOD. This looks AMAZING! Totally hits that pickle craving spot!